In April, 2012, "Rescue One," a non-accredited exotic-animal facility in Lancaster, Ohio, determined that it could no longer afford to care for the animals it was housing. Fortunately, the director of Rescue One contacted the Global Federation of Animal Sanctuaries to ask for help. The director of the Global Federation of Animal Sanctuaries in turn, called Bobbi at Lions Tigers & Bears, as we are one of the very few fully-accredited Big Cat sanctuaries in the United States, to assist in relocating the soon-to-be-homeless animals. Bobbi flew to Ohio to assess the situation and to help find homes for the 31 displaced animals, including lions, tigers, cougars, wolves, and a black bear. What she found when she arrived was shocking: the gauge wire used to house the animals was not adequately strong and did not meet GFAS standards. There were fence repairs that needed to be made. Though most of the enclosures had an indoor "lock out" area, these were not the type of lockouts that can be used in conjunction with transport cages, making rescues or veterinary exams difficult, if not impossible, without darting the animals. 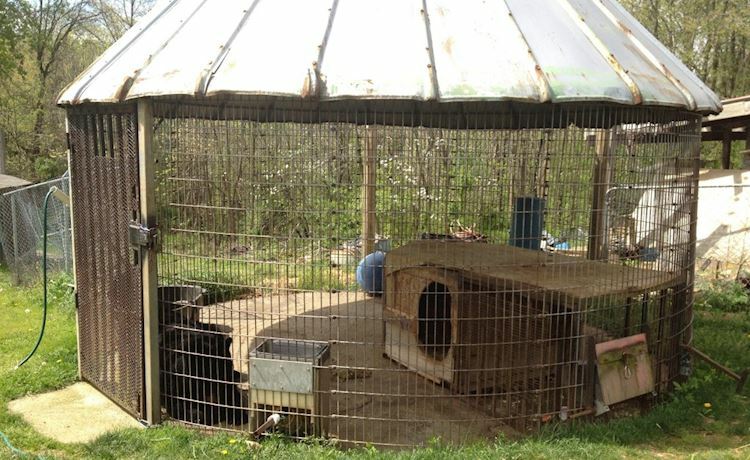 The bear was in a woefully small enclosure, entirely on cement. The owner's kitchen had previously housed a leopard and monkey in cages and now had been fenced off to house cougars. The ammonia stench from cougar urine inside the house was overpowering. In examining the animal records of the facility, Bobbi was alarmed at the number of animals that had arrived and died at the facility. Problems with contamination on feeding tubes (which food slides through to the inside of enclosures) was noted, creating a health risk for the large cats. Not surprisingly, the USDA license for Rescue One had been canceled the year before. More than $50,000 was raised that went strictly for transport and medical costs for the relocation of the animals, thanks to our generous donors, along with other national humane organizations and private foundations. In these early days of Lions Tigers & Bears, there was no staff or multiple animal transport hauler. Bobbi's father, Rich, retrofitted our horse trailers to accommodate one large divided cage or 3 transfer cages, a generator and temperature controls. A driver with a large hauler was hired and the three of them personally transported these animals and oversaw the relocation of all the big cats and the bear. Working together with the Global Federation of Animal Sanctuaries, placements were found in appropriate sanctuaries in North Carolina, Mississippi, Texas, Nevada, California, and at one AZA accredited zoo. Those eight facilities took on lifetime care costs for each animal they took in (which for big cats can easily run $10,000 a year per cat), and in a couple of cases, the costs of building new enclosures for the animals. The one black bear, named Sugar Bear, came back with Bobbi to California where he now lives with three other bears - Liberty, Blossom, and Delilah - in the newly built "Black Bear Habitat".